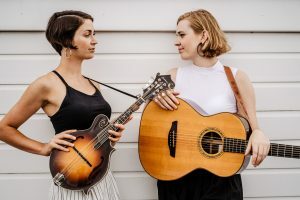 Celtic Connections Danny Kyle Award winner Bella Gaffney (guitar, vocals) and acclaimed mandolin player Polly Bolton came together last year, fusing Celtic folk with bluegrass in an exciting new collaboration. Joined by Sarah Smout (cello) and Holly Brandon (fiddle) for 2019, this all-female four-piece is already establishing a fearsome reputation for their glittering live shows, onstage rapport and genre-busting original and traditional material. Celtic Connections Danny Kyle Award winner Bella Gaffney (guitar, banjo, vocals) hails from Bradford. She writes folk inspired songs which she performs along with her own original arrangements of traditional pieces. Bella released her second album ‘Heaven Knows’ in the summer, and has supported folk luminaries including Jon Boden, Cara Dillon and Altan. 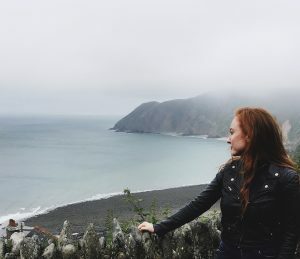 She has appeared at festivals including Celtic Connections, Southwell Folk Festival, Bromyard folk festival, Moseley Folk Festival, Beverley Folk Festival, HebCelt and many more. York-based Polly Bolton (mandolin, banjo, vocals) first picked up the mandolin as a child and has been touring internationally in various line ups since her early teens. She has performed at festivals including Wilderness, Boomtown Fair, Deer Shed, Festa do Avante! (Portugal), Beverley Folk Festival, Musicport, Towersey and Broadstairs Folk Week, as well as support slots with Tcha Limberger & Mozes Rosenberg, LAU and Hot Club of Cowtown. Polly is endorsed by Eastman™ (www.eastmanguitars.com). Polly & Bella first jammed backstage after a show in York in the autumn of 2017 and the project grew from there. A great musical friendship, they work collaboratively, arranging material led by powerful vocals and glittering instrumental collaboration. They each draw on their transatlantic influences to create their own blend of Celtic, bluegrass, oldtime and folk. 2018 has seen the lineup expand to a quartet. The pair begun working with acclaimed cellist Sarah Smout (Michael Chapman, Medieval Baebes, Bridget St John, Jess Morgan) in the spring and recently welcomed fourth band member Holly Brandon on fiddle. The project has been exceptionally well received so far, and over the past few months they have performed at Cambridge Folk Festival, main stage at Wickham Festival, Towersey Festival, Deer Shed Festival, Grassington and many more. They released their debut EP at a sold out show at The Great Yorkshire Fringe in July and they are recording an album with the full quartet, set for release in 2019.